FIFA 13 isn't a gigantic step on from FIFA 12. It looks more polished, its Career Mode is deeper and, as is the case every year, once you sink a couple of hours into it returning to last year's iteration is unthinkable. But it lacks any jaw dropping feature that makes it feel like an undisputed champ in its genre – a fact that isn't helped by the fact PES 2013 and Football Manager 2013 will be the strongest challenges it will have faced in years. All that having been said, there's plenty to admire about FIFA 13. The tweaks, tucks and additions to the game's engine have changed the feel of EA's football sim significantly, delivering a shot of realism to the on-pitch action. The first and most obvious change is the First Touch mechanic, which will initially take some time getting used to. In earlier games, long passes simply found their way – almost magnetically – onto their recipient's boot. Now only highly-skilled players can pluck the ball out of the air with ease. Everyone else has to be aware of factors such as speed, weather and opponents jockeying for position. Try to control a lofted ball with an average-skilled defender and a striker bearing down on him, and you risk turning the ball into the attacker's path and offering them a shot on goal. The attacking AI has had quite a bit of work done. Players now bend or stagger their runs in order to remain on side as an attacking formation converges on the box. Players also have more options in attack and defence around free kicks. Attacking sides can send players on dummy runs before the kick is taken, or have up to three players fake a kick take, while defending sides can add players to the wall and shimmy a little closer to the kicker. There's more immediate control over the ball at the player's feet now, thanks to the game using a tweaked version of FIFA Street's dribbling engine, and the all round new physicality of the collision engine allows players to bump and bodycheck opponents. It all adds up to a football experience that feels as real and unpredictable as the real thing. Every tackle, set-piece and goal feels unique, and there's no sense that any action on the pitch could be recreated exactly the same way. Xbox 360 owners can even use Kinect to change formations and substitute players on the fly – although watch the swearing at the refs as they tend to come down hard on teams managed by mouthy players. Away from the pitch Career Mode has been deepened and – like the rest of the game – made more realistic. The transfer system has been enhanced; now teams attach value to players depending on their skill and their value to the first team squad so snagging the likes of David Silva isn't as easy as it was last year. Furthermore, players can insist on certain transfer terms – such as clearing space on the roster, or guaranteed first team starts – as part of the deal. Managers who renege on these terms lower their acquisition's morale. Wage and transfer budgets can be blurred like last year, but for the first time, players can be offered as part of a transfer bid. Players can opt to play as a manager, player, or a player manager, and as they make their reputation they're given certain goals to accomplish. If they hit their targets, they'll receive international call-ups – the chance to play or manage their country's national side – and they'll have the opportunity to play in international friendlies, qualifiers and tournaments. EA Sports has also added a series of Skill Games based around the different disciplines in football; passing, crossing, dribbling, shooting, advanced shooting, lobs, taking penalties and taking free kicks. Not only is this a handy introduction to the game's controls for newbies, but it gives veterans something to shoot for. 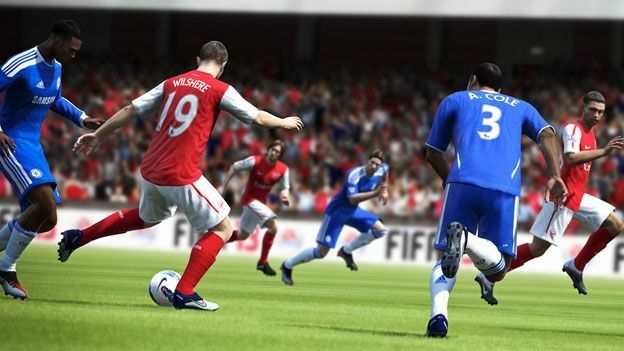 Finally, FIFA 13 is bursting at the seams with content – boots, uniforms, free-passes into international play - which the player can unlock by earning and spending XP in the EA Sports Football Club. FIFA 13 is inarguably very solid. Like every FIFA entry it looks and plays better than its predecessor, and the addition of Skill Games and a deeper Career Mode are welcome additions. It just doesn't contain any mind-shattering innovations we've come to expect from this series. Maybe that'll come with the next generation of consoles. FIFA 13 may be more an enhancement than a revolution, but it's still the strongest football simulation on the market.